Perfect for the February birthday! 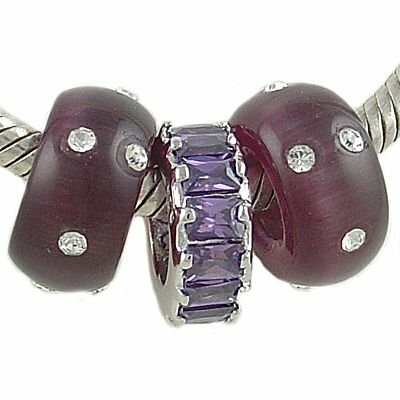 This set of three coordinating purple bead charms for your European charm bracelet includes the center bead of the set which is a .925 Sterling Silver and Baguette CZ European Spacer Bead Charm. The sterling silver band is set all around with purple amethyst February Birthstone cubic zirconias, adding loads of bling to your bracelet. Also included are two purple cat's eye glass beads set with tiny rhinestones. These three beads add a wonderful flash of color and glitz to any bracelet! All three beads are unthreaded and have large holes, ranging from 5 - 6.5mm. They are designed to slide onto your bracelet with ease. Compatible with the most popular bracelet brands!